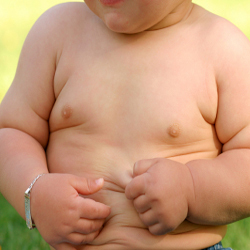 Obesity in children, a worrisome problem. Visit our Media Portal to listen to the podcast of this interview. Obesity in children is a worrisome problem. Just look at the recent statistics. The Canadian Community Health Survey (2004) showed that based on height and weight, 18% of Canadian children between the ages of 2 and 17 are overweight and 8.2% are obese. Dr. Laurent Legault, endocrinologist at the MCH, explains the factors involved in this epidemic and outlines some solutions to address it. According to Dr. Legault, the obesity problem is a reflection of society’s choices. Changes in lifestyle have contributed to this phenomenon and it’s been happening for some years. Among the culprits: prepared meals, fast food, foods high in sugar and salt, and larger portion sizes. This combined with a more sedentary lifestyle illustrated by the decline in extracurricular activities and the ever-increasing popularity of computers and video games results in children consuming more calories than ever – calories that they’re not burning off. Parents need to be pay attention. Normally, a child is at risk of gaining weight before four years of age or at the beginning of adolescence. It’s therefore important to follow a regular routine to measure any weight gain. If it’s significant, you have to do something about it but you also have to find the causes. Is your child always hungry? Ask why. According to Dr. Legault, this inability to satisfy their hunger may be explained by eating too quickly or just turning to food because they having nothing to do in the way of activities. We all know that there is a delay between the time we eat and when our brains receive the message that we’re full. If a child eats too quickly, they will have the impression of still being hungry even after finishing the meal. It’s therefore important to teach your child how to chew food well and to take the time to taste and enjoy the meal. When it’s a case of having nothing to do, Dr. Legault advises that you keep your child busy, which he acknowledges is sometimes difficult to manage. Often, when children come home from school there’s nobody at home. They therefore have free access to the fridge and, if there are no activities planned, they’ll probably go sit in front of the TV or the computer with snacks that are not always healthy. There are no miracle solutions. Even though we’ve recently heard about medications that control excess weight, these are not a solution for children and adolescents. We can count on one hand the number of MCH patients who have benefited from this type of treatment. These medications have been given to adolescents as part of clinical studies, but they have shown little impact on their weight. The weight loss observed is only about 5% a year, which is minimal. When these types of medications are used, it’s essential that people make changes to their lifestyle habits as well. To succeed in changing our children’s bad habits, everyone at all levels of society must do their part. Involvement from government, schools, healthcare professionals and the food industry is essential to sensitize, educate and provide the necessary resources to the general public. For parents, the thing to do is focus on healthy eating and physical activity. A very simple solution but one that requires a certain amount of effort.